Florida Governor Charlie Crist raised over 4 million dollars for his senate campaign in the first quarter. That number seems very impressive until you look at some of the details. When you compare Crist's numbers to his Republican opponent Marco Rubio, you may begin to see a different story than those you are reading in the Media. So Crist raised 4 million and Rubio raised 340 thousand. That is more than a 10 to 1 margin. That number seems insurmountable until you dig a little deeper. on Tuesday lit into the National Republican Senatorial Committee (NRSC) for endorsing Gov. Charlie Crist over another Republican in Florida’s open Senate race. Huckabee announced his official support for former state House Speaker Marco Rubio (R) in a video Tuesday. In an interview with The Hill, he criticized the NRSC for turning its back on a true conservative. 'I’m disgusted that they would take a position in a hotly contested race when you have a quality candidate like Marco Rubio, who was the youngest Speaker in the Florida House,' Huckabee said. 'This is not just some nameless, faceless guy that decided to throw his name in, who had no chance and no credibility.'" Secondly, the media have been talking about Charlie Crist for three years or more and that is a huge advantage to Crist and his campaign. Any Google or Yahoo news search proves that Crist has more than a 7 to 1 advantage in face time and ink over Speaker Rubio. On Google News (at this moment) it's 1,803 hits for Crist and 325 for Rubio That number ,along with the NRSC endorsement, nearly correlates with amount of money received by each candidate. The final point comes from some recent poll results. ...While the poll did show that Governor Charlie Crist still leads former House Speaker Marco Rubio by a 51-23 vote among all Republicans, the lead is based heavily upon his high name ID and Rubio’s low name recognition to date. The numbers tighten significantly among Republicans who consider themselves familiar with both men. 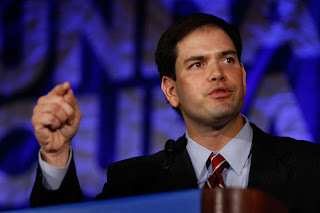 There is a little more than a year to go before the 2010 primary and I am certain that true Conservatives will rally around Marco Rubio and tell Crist and Washington DC that they are fed up with the same old pandering pork barrel politics that we have experienced over the past few years. Crist tried to ride the coat tails of John McCain to a more successful career and even appeared with Obama to support the stimulus package. He is NOT the kind of Republican I thought he was and I won't forget it. Marco Rubio is building a grassroots campaign for Conervatism and he is beginning to gain on Crist. The surge may be subtle but it's steady and building. Republicans are starting to watch and listen and they don't like what they are seeing and hearing from Crist. 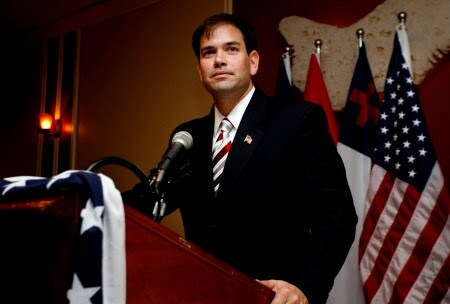 Marco Rubio deserves to go to Washington as the next US Senator to represent Florida!